Our mission statement: "To provide through an animal shelter, love and care to domestic animals until they find their forever homes." Our goal: "To build and maintain a no-kill animal shelter with organized adoption for the domestic animals which will come under our care." January 17th, 2007 - Organized the Carroll County Animal Protection League- first meeting held at the Carrollton Friendship Center, located at the Carroll County Fairgrounds. June 2007: Acquired our 501 (c) (3) non-profit status from the Internal Revenue Service and the State of Ohio Attorney General's Office, and tax exempt status from the State of Ohio. July 1st 2009: Purchased 5.393 acres on State Route 43 between Carrollton, Ohio and Malvern, Ohio. (physical address is: 4901 Canton Rd. NW. Carrollton, Ohio - county of Carroll). By the generosity of two anonymous members, they co-signed for our loan from Consumer's National Bank of Carrollton, Ohio to purchase this acreage at a purchase price of $29,000.00 with a $1,000.00 grant by the Carroll Cooperative "People for People Fund" to acquire our $28,000.00 loan on our land. 2009 to present: Hired Mr. Patrick Cooper of Willoughby and Company, Inc. New Philadelphia, Ohio. Mr. Cooper has done a one year audit (2009-cost $2250.00), and a two-year audit (2010-2011-cost $2250.00), and our taxes for the last four years, which also included our 990 taxes to the IRS and State of Ohio Attorney General's Office. when we are ready for the installation. October 2010: Accepted Shecklers Excavating, Inc. bid to install the two-way driveway at a cost of $16,700.82. Almost half of this cost was covered by grants, CCAPL members, and individuals donations. The rest was covered by our numerous fund-raising activities. October 2011: Accepted Shecklers Excavating, Inc. bid to dig out the L-shaped parking lot, animal shelter site pad, grade and install two catch basins, one storm drain, and also put down 410 ton of limestone for the parking lot at a cost of $34, 152.00. Almost half of this expense was paid by grants, in which the Carroll County Foundation contributed to, individuals, CCAPL members, and an anonymous donor, and the rest raised by our numerous fund-raising activities. March 2011: Hettler Engineering, submitted our sewer plans to the State of Ohio and they have been paid for and approved. May 2012: Leased our mineral/gas rights on our property to Chesapeake Energy, which in-turn enabled us to payoff our loan to Consumer's National Bank and the balance put into our checking account. June 2012: Signed with Morton Buildings Inc, to do our animal shelter plans at a cost of $5,000.00 which has been paid in full. Lorna Whaley, a CCAPL member, was our Conceptual Planner in designing the animal shelter floor plans along with the valuable input from the Animal Shelter Construction Committee and the CCAPL's Board of Directors. 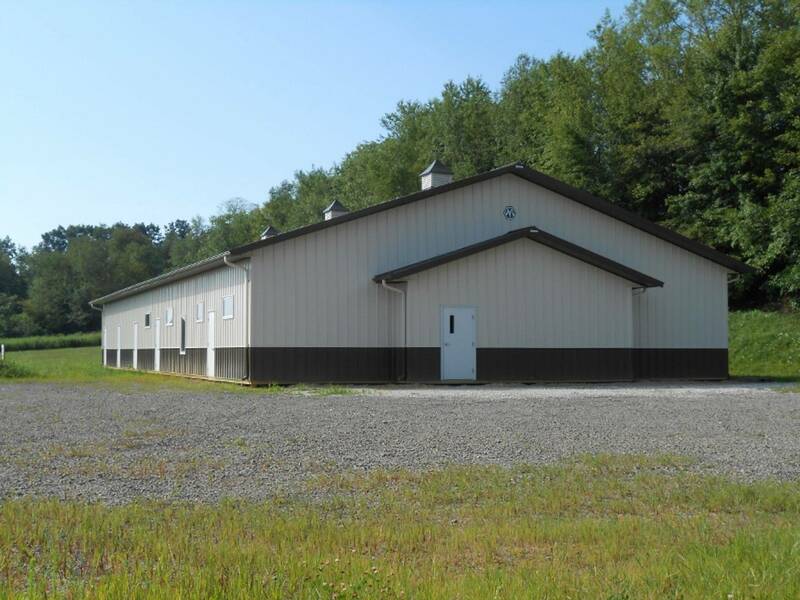 The Animal Shelter Construction Committee researched and visited numerous animal shelters in Ohio and also one in Tennessee to implement different ideas for our shelter plans with the animal's and public's safety and well-being utmost and foremost. As of 2013, we have $93,248.28 invested in our land, which does not include the yearly insurance premiums. We have accomplished so much since our beginning and have more to do. We know many are anxious to see our animal shelter built, but as anyone knows when designing and building a commercial building, it takes many dollars to do plus the planning, strategy, and steps in preparation and it is a continual learning process to undertake this monumental task, but we started out knowing this, and have moved so far forward since we started January 17th, 2007. We will continue in our efforts to build a greatly needed animal shelter for Carroll County, Ohio to save lives of many precious domestic animals when they will come under our care in our "no-kill" animal shelter. Cost to build the animal shelter to completion outside and inside is: $500,000.00. After this construction is started, we will continue to pursue all avenues for resources to supply the needs required to take care of an animal entering our shelter and for general operation for inside items needed. We will also implement safety features for the animals, volunteers, and also for the general populous which will enter our shelter for adoption procedures and visitation. We feel once we get started with construction and this is seen by the general populous, and members, and also visitors to Carroll County, Ohio, we will receive more monetary donations, plus donations of items needed for the animal shelter. The Animal Shelter Committee is currently working on getting prices for items needed for and in the no-kill animal shelter. We will pursue grant funding, other entity resources, and the general populous to supply the majority of these needs once we acquired the necessary funding to start construction.